New Sailor Moon anime to be released in 2013! This year marks the 20th anniversary of the release of �Bishoujo Senshi Sailor Moon� and to celebrate there was a talk event held on July 6th at Roppongi�s Nicofarre. 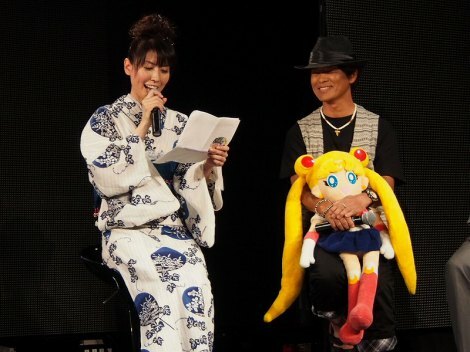 During the event, it was announced that a new Sailor Moon anime is currently in the works and is set for release in summer of 2013 with idol group Momoiro Clover Z singing the theme song. Momoiro Clover Z participated in the event through a live hook-up from �Japan Expo� in Paris, France. The girls even took part in Sailor Moon cosplay and enthusiastically sang the beloved theme song �Moonlight Densetsu�. Voice Actress Mitsuishi Kotono (Tsukino Usagi/Sailor Moon) and Furuya Tohru (Chiba Mamoru/Tuxedo Mask) attended the event alongside Kodansha's Osano Fumio, who used to be the editor of Takeuchi Naoko (the author of "Sailor Moon"). �Bishoujo Senshi Sailor Moon� first began in the February 1992 issue of �Nakayoshi�. Since then, there have been a TV anime, movies, musicals, and a TV drama. It�s a series that has a variety of mixed media involved with it. The moon wands and other items have also become extremely popular and it was a social phenomenon back in those days as well. The comics and anime books have been released in 17 different languages and have become popular throughout the world as well. In regards to that, they are aiming to release this new anime simultaneously throughout the world. Thanks to everybody who sent this tip! YUKI to provide theme song for "Himitsu no Akko-chan"